Just 8 km from Bordeaux and a few minutes walk from the Garonne riverside, Le Chai d’Arcins is an ideal base for visiting Bordeaux and its vineyards. This former stone barrel cellar has been converted into a comfortable home while remaining sympathetic to the original builing and favouring traditional materials such as stone, terracotta and timber. The open plan living room opens onto a partially covered patio courtyard with a 15m path leading to the 9x4 metre pool tucked away in a mature garden. Upstairs the three bedrooms (one ensuite) and main bathroom open onto a wraparound gallery overlooking the living area. The house is centrally heated so also perfect for a winter break. Le Chai d'Arcins is situated, near the Garonne river, 8 kms from Bordeaux, and 2 kms from the nearest village, Latresne. A right turn on the nearby Garonne-side cycle track follows the river into Bordeaux, a left turn takes your on a 60 km ride on a dedicated track into the EntreDeuxMers countryside for 60kms to Sauveterre de Guyenne. Le Chai is just a one-hour drive from the Atlantic beaches and is also well located for visiting the region’s many vineyards such as St Emilion and the Médoc. A car is essential so that you can make the most of all that the Bordeaux area has to offer (vineyards, bastide and medieval villages, beaches). Plenty of free parking in front of the house. If you prefer not to drive into Bordeaux, there is a park-and-ride carpark just a 15 minute drive away where you can access the Bordeaux tram network. Please note that the nearby main road can be heard from the pool area. 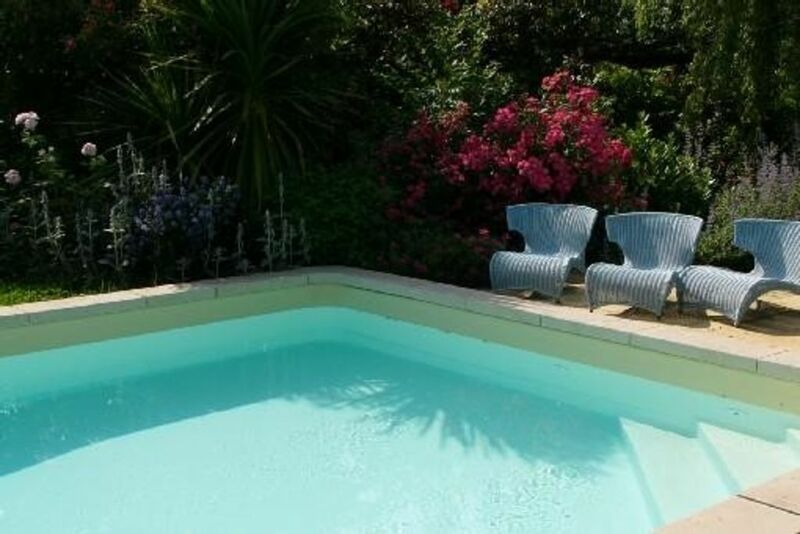 On the doorstep of Bordeaux and just a short walk from the leafy banks of the Garonne river, le Chai d'Arcins is an ideal location for making the most of all that the Bordeaux area has to offer. Bordeaux itself is only 8 kms away. The vineyards of the Premières Côtes de Bordeaux appellation are in the immediate vicinity and those of St Emilion and the Médoc under 40 minutes away. Arcachon and the Atlantic beaches are just a little over an hour's drive. A car is essential to make the most of your visit as since Latresne is outside the Bordeaux metropolitan area, access to public transport is inconvenient. Master bedroom with ensuite shower room WC. Main bathroom with bath, basin WC. Third WC on ground floor. As the patio courtyard is partially covered, outdoor eating is possible whatever the weatther. Ideally located for visiting Bordeaux and its vineyards Courtyard patio for barbecues and outdoor dining Gas central heating throughout. Fully equipped laundry room. Our family has been scattered across the globe over the last three years so we decided to mark our son's 30th birthday by surprising him. We all arranged to meet in this wonderful converted wine cellar/barn. As he and his girlfriend opened the door we were all sitting there with cheese and wine to welcome him. Needless to say he was overwhelmed and this marked the beginning of four wonderful days reconnecting. Our host Emmanuel was wonderful and we spent hours talking, playing cards and enjoying the local produce. Could not reccomend this place more highly. We had a wonderful stay and loved the beautiful decor in this delightful converted barn. It is a good size yet very cosy. We had lovely walks along the river enjoying the autumn foliage. A perfect place close to Bordeaux to enjoy a break with family or friends. Thank you Angela. We are delighted you enjoyed your stay. It was a pleasure to host you. Valerie L.Where do you live? This is a very nice place to stay when visiting Bordeaux and surrounding area. The house is very lovely, with an equally beautiful garden surrounded by trees which makes the pool very private but it still gets plenty of sun. The house is very tastefully decorated and well equipped and is situated in a little hamlet not far from the Garonne river. There is a nice cycle track along the river so you can cycle into Bordeaux in 20 minutes or in the other direction, out into the countryside. Latresne itself is a small village with a very nice market on Sundays. In fact the house is ideally situated – not far from Bordeaux yet practically in the country. Carmel and Emmanuel were very helpful with advice prior to our arrival and welcomed us warmly, giving us lots of information and tips. They recommended visiting St. Emilion which is just over half an hour away and we were delighted we followed their advice as it is a very beautiful medieval village well worth visiting quite apart from the wine-tasting. We enjoyed Bordeaux itself very much and it is only a 15-minute drive away from Le Chai. All in all, we would very much recommend renting this house and would love to stay there again ourselves for a longer holiday. Thank you. We are glad you enjoyed your stay. After 3 months of constantly being on the road it was great to finally 'drop anchor' at Le Chai for 4 weeks. We found Carmel and Emmanuel to be extremely friendly, helpful and knowledgeable hosts. The house has been very tastefully decorated, maintaining it's Bordelais charm, character and rustic French flavour. Convenient to everything, including supermarket, Sunday markets at the village of Latresne and the beautiful city centre of Bordeaux (easily reached in 15 minutes by car - or car plus a tram ride over the bridge). The house was comfortable and very clean, with a well-equipped kitchen (which we very much appreciated). The welcome bottle of Dourthe No. 1 introduced me to what is now my favourite wine. It was also only 100m to the river where we took relaxed walks along the road lined with trees changing to their beautiful autumn colours.We took day trips to the pretty coastal town of Arcachon, famous St Emilion, Talmont-sur-Gironde, visited several chateaux/wineries. All in all a great stay and a great spot! Only 7 kms from the centre of Bordeaux, Le Chai is an ideal base for visiting Bordeaux and its many vineyards. Walkers and cyclists will appreciate the nearby cycle track which winds its way through 60 kms of the woods and vines of the Entre Deux Mers to the historic bastide town of Sauveterre de Guyenne. Tennis and horseriding facilities in the village of Latresne, 2 kms away. Excellent restaurants in the area. Nearby Bordeaux (UNESCO Heritage Site)-offers all the leisure and cultural activities of a large historic city. The ocean and it's rolling surf is an hour's drive away, as are several soft-water lakes for windsurfing, sailing, water skiing. The vineyards of Loupiac and Cadillac within easy reach, St Emilion just a 30-minute drive away. The Médoc a little further. Many lovely Bastide villages to visit, each with its farmers' market. Direct booking Bookings can be made directly with the owners. Inquiries and booking requests can be made by email to lechaidarcins@gmail.com. A rental agreement will then be sent with the following terms : booking deposit (35% of the price) due at the time of booking, balance (65%) due 6 calendar weeks before the booking starts, damage deposit (500Eur) requested on arrival. Changeover day In July & August, bookings for Le Chai d'Arcins run from 4pm Saturday afternoon to 10.30am Saturday morning. Bookings starting and/or ending on other days of the week are possible outside peak periods (July & August). The minimum stay is one week in July & August. Long lets possible during the low & mid-season. Réservations en direct : Les réservations peuvent être effectuées directement auprès de propriétaires en les contactant par mail à lechaidarcins@gmail.com. Un contrat de location sera envoyé avec les conditions suivantes : Acompte - 35% à règler à la réservation Solde - 65% à règler 6 semaines avant le début du séjour Caution - 500Eur à remettre à l'arrivée. En juillet et août, les séjours au Chai d'Arcins commencent le samedi à partir de 16h et se terminent le samedi à 10h30. Des arrivées ou départs en semaine ou le dimanche peuvent être envisagés en dehors de la haute saison (juillet & août). En haute saison le séjour minimum est d'une semaine. Séjours longs possibles en périodes creuses.